We didn't see a whole lot of sci-fi tech in the first movie but here you get a firm reminder all the way through that Thor and everyone not residing on Earth all come from space and aren't just magical beings living in some magical fantasy realm. They use actual technology too. Most importantly, the humor is still there, delivered naturally as the story unfolds, particularly by intern, Darcy played by Kat Dennings, whose own TV show, Two Broke Girls, could learn a thing or two about natural humor over continuous, cheap one liners. I so much like Kat better when she's delivering genuinely funny lines in Thor's movies. I do think the first movie was more laugh out loud funny than The Dark World but this offering has a lot of very subtle humor that's easy to miss on first viewing. One thing that I did miss, which isn't really a spoiler, is the lack of any presence of SHIELD in this movie. If memory serves me correctly SHIELD weren't that present in Iron Man 3 either. SHIELD was such a big part of Marvel's phase 1 films that they should continue to be present in phase 2 and beyond. Any business of Superheroes is SHIELD's business - it's what they do. SHIELD is name dropped in the Dark World and that's about it. 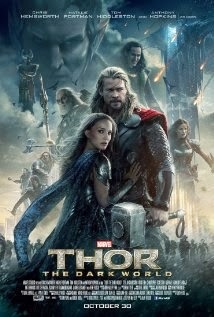 Even if the events of this movie takes place in the space of a day I think SHIELD is equipped to make quick responses. They're not a small organization and they have some of the most advanced tech on the planet... oh... and they have the internet too right? Look how fast the average person responds to any breaking news on the internet. SHIELD could do better than that I would've thought? Since we know Agent Coulson is alive it might have been nice to see him, or even his replacement, looking up at whatever that craft is that attacks Earth in Dark World with some kind of acknowledgement that "It's definitely not something of Starks!". Hopefully Marvel make up for the lack of SHIELD in Captain America's next outing, The Winter Soldier. Those are all the things that stood out for me. If I were to go into more detail about what I did or didn't like I'd have to spoil much of the film. It's not all great, there are some questionable moments, but overall, the film is a lot of fun. Well worth seeing and a film that I will add to my own DVD collection for sure.